Manage your appointments, classes, point of sale and marketing. One solution for your all your daily operations. Track individual and group appointments, assign multiple employees and resources and easily see the state of every appointment. You'll never waste time struggling to keep track of your schedule. Track and control your employees. Manage all your employee schedules, shifts and off days and track work hours using the time clocking function. Your employees can view and edit their schedules from anywhere. Keep track of attendance, session usage and memberships. You can also empower your clients by allowing them to book online, and to check in on arrival using a membership card. Record sales and track stock. Integrated invoicing records your sales, tracks employee commission and automates your stock control. Streamline sales with an optional bar code scanner and receipt printer. Send bulk email or SMS messages to your clients based on their individual history at your business. You can also automate appointment reminders, follow up sessions and thank you messages. Get insight into your performance. 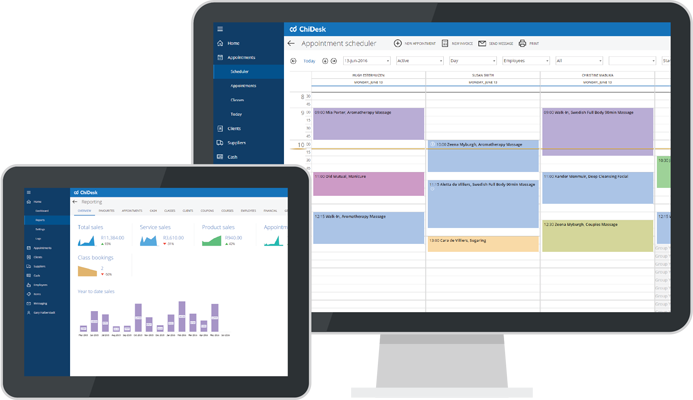 Straight-forward reports give you the tools to manage your business more effectively. From sales, to commission and employee performance, we have you covered. Sign up for a free trial or explore appointment scheduling. Free branded mobile web app. Our mobile web app is free of charge. Just point your clients to your web address and they can immediately begin booking services, purchasing products and managing their profile. There's no app to download and install, and it works on any device. ChiDesk is designed to function on almost any device. We support all major browsers including Internet Explorer, FireFox, Chrome, Safari, and Opera. Securely hosted in the cloud, you don't need to install any software or maintain any servers. If you have a web browser, you have ChiDesk. We backup your data on a daily basis, and use industry-standard SSL to encrypt all communications between our servers and your devices. Get an obligation free trial of ChiDesk. You can keep all the information loaded into your trial system if you decide to sign-up.